The Government has issued the notification for the Prevention of Cruelty to Animals (Pet Shop) Rules, 2016 here today. In an interaction with mediapersons here today, the Minister of State (Independent Charge) in Ministry of Environment, Forest and Climate Change, Shri Anil Madhav Dave said that this is meant to regulate pet shops. Shri Dave said that and it was an area that was uncontrolled. The Minister added that suggestions from all the stakeholders and the states will be sought. The Ministry will be notifying the proposed draft Rules in the Gazette of India for public information. The notification will be available on the Ministry’s website also. Any person can make any suggestion on the said draft rules in writing for consideration of the Central Government to the Deputy Secretary, Animal Welfare Division, Ministry of Environment, Forest and Climate Change, Indira Paryavaran Bhawan, New Delhi, within 30 days of such publication of the Rules. Ministry of Environment, Forest and Climate Change has the mandate to implement the Prevention of Cruelty to Animals (PCA) Act, 1960, to prevent infliction of unnecessary pain, or suffering on animals. The provisions of the PCA Act are general in nature, and rules dealing with specific situations have to be notified from time to time. Objective: The objective of these rules is to make pet shops accountable and to prevent cruelty inflicted on animals kept in such pet shops. (i) It will be mandatory for all pet shop owners to register themselves with the State Animal Welfare Board of the respective State Governments/Union Territories. (ii) Such shops will be registered only after inspection by the representatives of State Board, a veterinary practitioner and a representative of Society for Prevention of Cruelty to Animals. (iii) The rules define space requirement for birds, cats, dogs, rabbits, guinea pig, hamster, rats and mice in the pet shops. (iv) It defines the basic amenities, power back-up, general care, veterinary care and other operational requirement for animals kept in pet shops. (v) It is mandatory to maintain proper records of sale, purchase, death of animals in pet shop, sick animals etc. 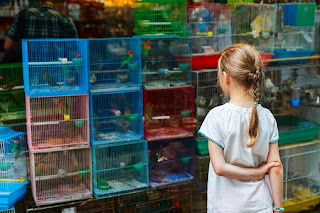 (vi) Every pet shop owner is required to submit yearly report to the State Board regarding animals, sold, traded, bartered, brokered, given away, boarded or exhibited during previous year, or any other information asked for by the State Board. Violation of Rules: Non-compliance of the proposed rules will lead to cancellation of registration of pet shop and pet animals so confiscated, shall be handed over to an Animal Welfare Organisation, or a rescue centre recognised by the Board.